Mechanical insulation is a well-developed technology for reducing energy consumption. Most professionals in the insulation industry have a fundamental appreciation for insulation’s energy-saving benefits. Insulating a bare surface can easily reduce heat losses or heat gains by 90 to 95 percent, and the need to conserve energy is obviously increasing. Approximately 85 percent of the United States’ energy comes from the combustion of fossil fuels (coal, oil, and natural gas). While there is considerable debate about the size of the nation’s fossil fuel reserves and how much longer they will last, it is clear that at some point fossil fuels will be too valuable to burn. Some would argue we have already reached that point. The economic penalty associated with uninsulated pipes, ducts, and equipment is becoming unacceptable. Less appreciated is the environmental penalty associated with the products of combustion from fossil fuels: carbon dioxide (CO2) and water vapor. Both are considered greenhouse gases. The concern is that increasing concentrations of greenhouse gases in our atmosphere are contributing to climate change. The topic is receiving unprecedented attention in the scientific community and in the press. As an example, consider a chemical facility that uses steam at 350°F in a manufacturing process that operates year round. The steam is produced in an oil-fired boiler operating at an average efficiency of 80 percent. Cost of purchased fuel oil is $4 per gallon. The 4-inch steam header is outdoors and insulated with 2 inches of fiberglass pipe insulation. The calculations in Figure 1 were made using the 3E Plus® computer program developed by the North American Insulation Manufacturers Association (NAIMA). The use of insulation has reduced the heat loss from the bare pipe, on average, by 95 percent. The associated fuel cost has likewise decreased by 95 percent for a fuel-cost savings of $417 per foot per year. This 95-percent reduction in fuel usage translates to a 95-percent reduction in CO2 emissions, a savings of 2,308 pounds of CO2 per year. As expected, the annual savings of $417 per foot per year is impressive and would undoubtedly yield a payback period measured in months. The reduction in CO2 emissions (2,308 pounds per foot per year) sounds impressive as well, but what does it really mean? How does that compare to other carbon-reducing technologies? Trees are an important part of the carbon cycle. Trees (and all green plants) use photosynthesis to remove and store carbon from the atmosphere (while at the same time releasing oxygen). In fact, trees are considered to be so beneficial that we can purchase carbon offsets associated with reforestation projects. One online site is offering, for about $12, the opportunity to purchase enough carbon offsets to cover the carbon emissions from an automobile trip of about 2,300 miles (roughly the distance from Detroit to Los Angeles). The funds are invested in reforestation projects in Africa and Asia. How much CO2 is absorbed by a tree? It varies with the type of tree, its location, and its stage in the life cycle. One source estimates that a single mature tree can absorb 48 pounds of CO2 per year. Another source estimates that, over an estimated 100-year lifetime, a cottonwood tree can absorb roughly 28 pounds of CO2 per year. A third source estimates that each tree will absorb 1 metric ton of carbon over its lifetime (equivalent to roughly 8,100 pounds of CO2 over its lifetime). This article will use a rough estimate of 50 pounds of CO2 per year. Figure 2 shows the simple comparison. Wow. 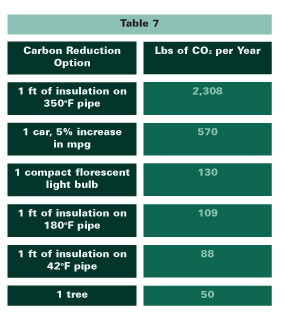 One would need to plant roughly 46 trees to achieve the same CO2 reductions achievable by insulating 1 foot of 350°F pipe. But most pipes aren’t at 350°F. Some operate at higher temperatures, and many at lower temperatures. For illustration, consider a hot water heating system in a commercial building. Assume an operating temperature of 180°F and a 2-inch pipe with 2 inch of elastomeric insulation. For this application, assume a “clean,” natural gas-fired system operating at 75 percent efficiency. Use a fuel cost of $10 per million cubic feet (Mcf) for natural gas. Again using the 3E Plus program, the calculations in Figure 3 can be estimated. In this case, the heat loss is reduced by 91 percent and the fuel cost savings are only $9 per foot per year. The CO2 emissions are also reduced by 91 percent, which translates to only 109 pounds per foot per year. This simple comparison is now shown in Figure 4. So one would only need to plant two trees to achieve roughly the same amount of CO2 reduction achievable by insulating 1 foot of these hot water pipes. What about cold piping? Let’s take a look at a 4-inch chilled water pipe insulated with 1 inch of cellular glass insulation. Assume that cooling is provided by electric chillers with a coefficient of performance of 3.0, and assume electricity is purchased at $0.10 per kilowatt-hour (kWh). Also, assume that the system is for a high-usage application that operates 95 percent of the time. 3E Plus yields the information in Figure 5. For this case, the dollar savings are around $6 per foot per year, and the CO2 reductions are roughly 88 pounds per foot per year. The simple comparison is shown in Figure 6. 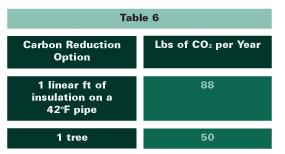 Again, one would need to plant two trees to achieve roughly the same annual reductions achieved by 1 foot of pipe insulation. Clearly, insulation is a significantly more effective means of reducing greenhouse gas concentrations than planting trees. This conclusion supports the notion that it is easier to avoid carbon emissions than it is to remove carbon from the atmosphere. So far, this discussion has not really considered the longer term considerations of forests and the carbon cycle. Most researchers consider mature forests to be carbon neutral, in that they contain some vegetation that is young and still growing (i.e., absorbing CO2 from the atmosphere and storing carbon), but this is balanced by vegetation that has died and is decaying (i.e., giving up CO2 to the atmosphere or the soil). While established forests serve as a significant storehouse for carbon, any carbon stored in trees is eventually returned to the environment. This discussion should not be interpreted as an argument for not planting trees. Trees provide many useful benefits. They provide shade in the summer, shelter for wildlife, and important building materials, and they are much more pleasing to look at than a piece of insulation. As a method for controlling greenhouse gases, however, insulation is greener than trees. What about other carbon-reduction technologies? How does insulation stack up to some of the other methods being discussed? Let’s consider the compact fluorescent light bulb (CFL). CFLs are a relatively new technology that can produce the same amount of light at roughly 25 percent of the electrical power consumption. Like insulation, they reduce greenhouse gas emissions by conserving energy. Replacing a 60-watt incandescent bulb with a 15-watt CFL in a fixture that operates 2,000 hours per year would save 90 kWh of electrical energy and roughly 130 pounds of CO2 emissions per year. What about more fuel-efficient cars? Combustion of gasoline releases about 20 pounds of CO2 per gallon of gasoline. Assuming 12,000 miles of driving per year, increasing the average fuel efficiency of a car by 1 mile per gallon (a 5-percent increase over the current national average of 20 miles per gallon) would save 29 gallons of gasoline per year and reduce CO2 emissions by roughly 570 pounds per year. Both of these examples represent significant contributions, which are summarized in Figure 7. This table is not meant to be all inclusive. There are certainly many more sustainable technologies available, and there are other assumptions that can be made when analyzing these technologies. Actual results will vary. The point is that insulation is a well-developed energy-conserving technology that provides greenhouse gas reductions comparable, and in some cases much greater than, other, more publicized technologies. Insulation should be a leading candidate when considering carbon offset projects. In terms of greenhouse gas reductions, insulation is, in fact, greener than trees.